In 1862, the Homestead Act was passed, and many hopeful settlers began arriving in Nebraska from points east - and from foreign countries. For a $10 filing fee, any homesteader over the age of 21 could claim a quarter-section of land. After living on the claim for five years, and making improvements, the homesteader became the proud (or not) owner of 160 acres. Since there were few trees or stones available, the building material for homes was, of necessity, the tough prairie sod, cut into blocks that were held together by a mat of grass roots. As time passed and more settlers arrived in Nebraska to build sod homes, the construction techniques were improved through shared experience. The homesteaders who will live in my sod house have arrived in Nebraska in 1886, with only their most necessary household goods and tools packed in a covered wagon. There are sufficient railway lines now to enable them to order goods from back east - but the cost is prohibitive, and much time must be allowed to receive a shipment of supplies. For my homesteaders, as for most, "making do or doing without" is the usual way of life on the prairie. After selecting the best possible building site - near a creek for a water supply, within a day's wagon trip to the nearest settlement, and only an hour's walk to a neighboring homestead - my pioneers are eager to begin cutting sod and building their new home on the treeless plains. FINALLY, MY MINIATURE SOD HOUSE IS UNDER CONSTRUCTION! The first step in constructing the soddy was to purchase a 4' by 4' piece of pressed wood (or something like pressed wood) from which to cut the base board for the house and its surrounding yard. The cut board measures 28 inches by 36 inches. I've drawn the outline of the 2 1/2 inch thick walls on the board. You can also see the window and door placement and the red dots where I will drive in the nails that support the styrofoam walls. Nails have been driven through the board from the underside so that the points project upward and can easily penetrate the styrofoam walls. 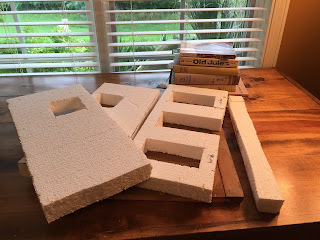 I cut the three main walls and the low back wall from a 1 1/2 inch thick sheet of styrofoam. (That's Robert's second homemade kayak on the right; it's a 17-foot beauty made from thin strips of walnut, western cedar, and Alaskan cedar. Robert used a kit from Redfish Kayak in Port Townsend, WA.) I could build one too, but styrofoam doesn't take too readily to the water. What a fast and easy little structure; the dry fit didn't take long! This is the "inner core" structure. Rather than lay sod blocks for the entire structure, I will lay the blocks as an outer wall, creating only the illusion of two thicknesses of sod blocks, which would have been the Real Life construction technique. The interior measures 14 inches by 18 inches with an exterior measurement of 19 inches by 23 inches. The interior walls of a sod house were scraped with a sharp spade after construction to make them as smooth as possible, but after the sod had settled for a while, lumps and bumps inevitably appeared. I used pieces of egg cartons and wine packaging to rough up the walls. This is the first layer of lumps and bumps. I applied joint compound over the cardboard pieces, but I forgot to take a photo. ...and applied more joint compound over the second layer of cardboard. I painted the exterior walls a dark color so that there would be no white styrofoam showing between the sod blocks. Ah, the sod blocks! You may remember this Mystery Material from my previous post. 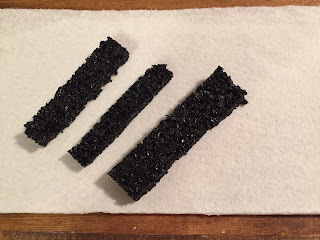 I thought it would be the perfect thing for sod blocks, although it was oh so tough and hard to cut. But I optimistically believed that I could cut it with a fine-toothed saw. I couldn't. Not even with a power saw, which only sent black bits flying every which way and made a big mess. I could imagine what an ugly time I would have trying to cut as many sod blocks as I'll need. So - back to my usual stuff - the steadfast styrofoam! 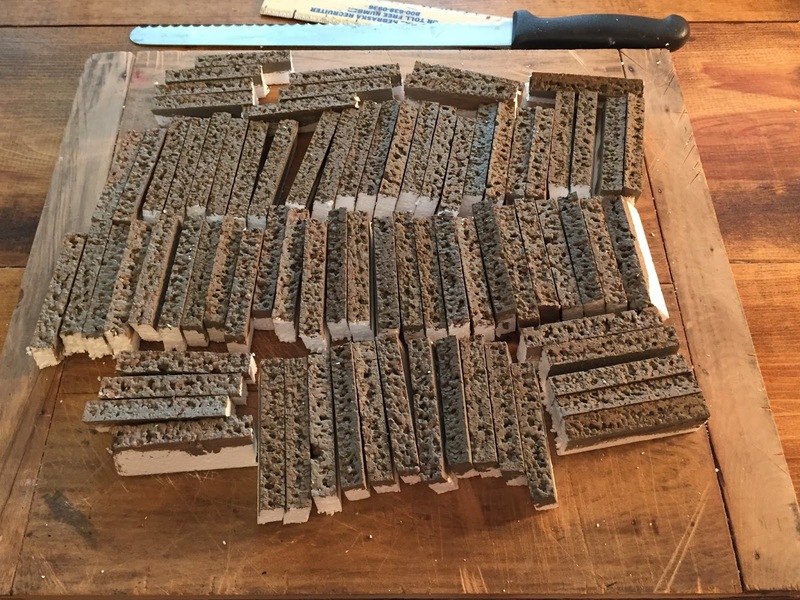 I decided to cut the sod blocks from sheets of 1/2 inch by 12 inch by 36 inch styrofoam. The size is very convenient to work with. I had discovered, in my experimenting, that the inside cuts of the styrofoam had ALMOST the perfect texture that I needed to replicate sod. 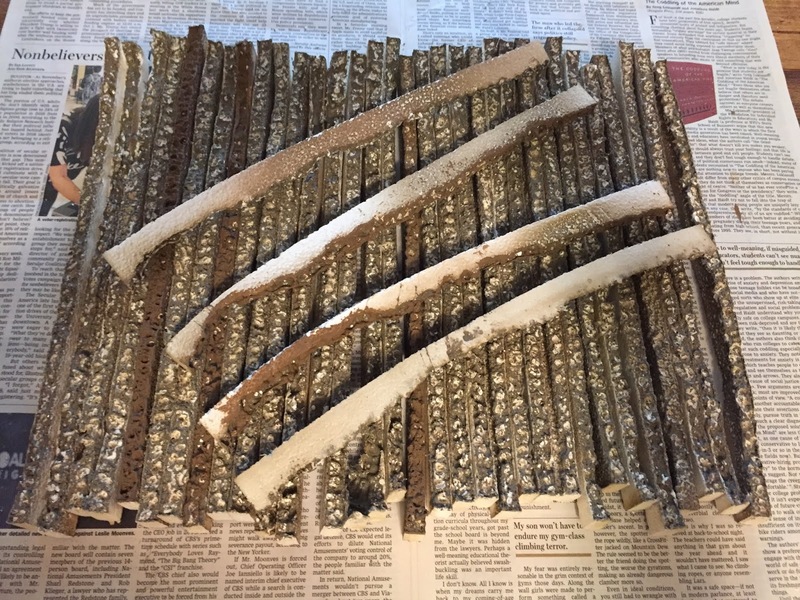 After cutting one-inch wide strips of the styrofoam, I enhanced the texture by poking holes in the sod edge with a slightly blunt knife. Things were moving along well. So well that I grew careless and FORGOT TO FOCUS. I had good intentions of trying out ONE strip of styrofoam to make sure that the spray paint would cover well and DO NO HARM. But instead, I put all the strips - every last one - into a paint box that I rigged up in the garage. And I sprayed the whole kit and caboodle in one fell swoop! And I did a LOT of harm! The spray paint melted the styrofoam like a hot knife melts butter. And to add to the frustration, the spray paint didn't even cover well! The good thing is that I can still use much of the misshapen mess, because I'll need filler and odd pieces of sod as I build the walls. Strips cut, holes poked. Ready to paint - with acrylic paint and a brush this time! Painting accomplished and NO HARM done! I've used a mixture of taupe, gray, and tan to achieve the color of old, dried sod. The styrofoam strips have been cut into three inch pieces - and they're close to turning into sod blocks; I just need to add the prairie grass. This batch of sod blocks will be enough to get me started, but there are many more to come. ...which resulted in just the right color and texture for prairie grass. This big batch of "grass" should be enough to complete the soddy. And yes, we did enjoy eating fresh corn on the cob OFTEN this summer! I've gotten this far so far, although I should have done more. It's been raining here for about forty days and forty nights, so although outdoor activities have come to a soggy halt and I'm confined indoors, my soddy time has been more limited than it should have been. Somehow various household tasks keep popping up to occupy my days. But I'm sort of on a Sod House roll now, so even if the sun should ever shine again, I'll be forced to neglect all outdoor chores and just concentrate on furthering the soddy construction. I hope that you'll stop by next time and see how (whether) those next steps are progressing. This is absolutely fascinating, Marjorie! I'm so excited to see the soddy begin, and in spite of the Styrofoam kryptonite incident, you're making a fantastic start! Leo is such a great help, and having been part of the process, will treasure the structure and the memories of time spent with you! I hope you find an excellent amount of focus time, and look forward to the next exciting and educational installment of The Sod House Diaries! Hi, Jodi - I'm happy that the Sod House construction is finally seriously underway. I enjoyed (probably too much) all the reading that I did in order to learn more about sod house history and construction, so it took me a while to turn all that book learnin' into some constructive action. It's going to be a fun project, but a much shorter one than the previous two. Thanks for stopping by! WOW - you have made a ton of progress, I'm sorry about the spray paint mishap, but sometimes things like that help us to grow and give us good stories to talk about! The sod house looks exciting and I enjoyed reading the history. ( I also enjoy good corn on the cob..) Looking forward to your next post! Hi, Troy - Thanks for the sympathetic comments! I never expected to make such a big mistake so early on - but that's at least one that I won't repeat. I've enjoyed reading about the sod house history, which I find fascinating. My admiration for the early settlers knows no bounds, but I'm glad that I don't have to trade places with any of them! Marjorie,has hecho un gran trabajo! La historia está lista y los primeros pasos de la casa en marcha,a pesar del incidente con el poliestireno. Leo está siendo un gran ayudante y así atesorará grandes recuerdos con su abuela! Estaré encantada de seguir tus progresos. Hello, Pilar - Thank you for your nice comments. It's always fun for me when the grandchildren have a chance to help a little on my miniature projects. It makes me happy to think that they're storing up some pleasant memories. The sod house is going to be an easier and shorter project than the previous ones - I'm looking forward to that! Hello, Rosa Maria - I'm so glad that you took the time to stop by to look at my Sod House. I've done so much reading about the homesteaders in Nebraska that I sometimes feel that I'm right back there among them. It was a hard life. 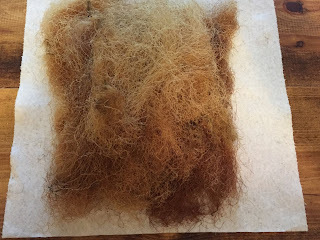 It's a very good thing that I thought to use cornsilk for the prairie grass that I need - I haven't come across anything else that will work as well. But I do wish that I'd known about the spray paint melting the stryofoam - that's something that I won't forget! Hi Marjorie! Your Sod House is looking amazing, and I love it that your grandson was happy to help! The foam for sods seems to be a good choice and will certainly keep the weight of this house under control! 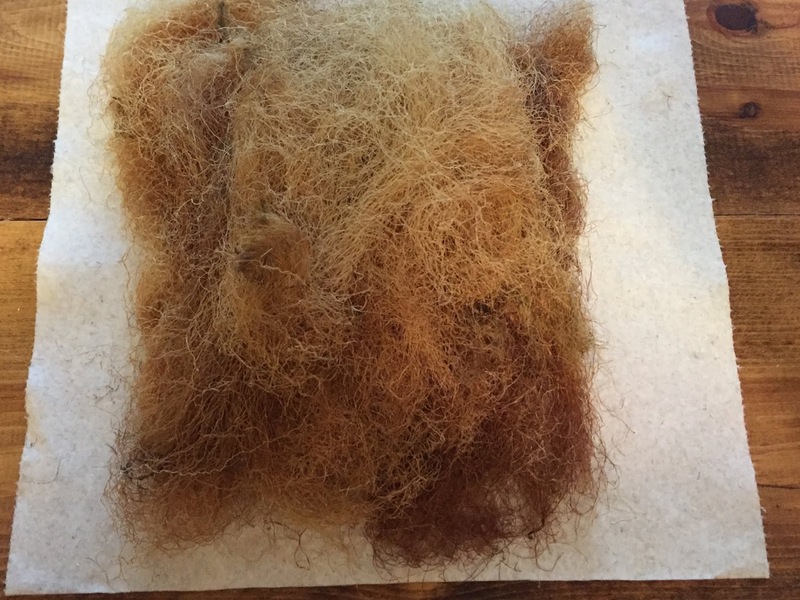 The corn silk looks great and I look forward to seeing the sods with the grass on them. It is fascinating to have the History of the houses explained and I will enjoy watching this grow. I hope you get some drier weather soon... we have also been very wet this summer and the gloom feels relentless! Hello, Betsy - Thanks for stopping by my soddy (to be.) I'm enjoying myself so far, and it is fun when one or more of the grandchildren can participate in the construction in some way. My next step in construction will be to add the prairie grass to the sod blocks, and I'm excited (and a little wary) about that. I'm so glad that you've liked reading about the sod house history - it's been an interesting learning experience for me as well. I hope the relentless gloom will soon turn to sunshine for both of us! Your projects are always so much fun and informative. It is looking great so far. It is wonderful when you can get some help from the grand kids lol. Hi, Maria - I'm happy that you think my new project is fun! I'm definitely having fun with it so far, and hopefully that will continue as I go forward. I'm always thinking of some small (and harmless) ways that the grandkids can help with my miniature houses - they really love to participate - and they feel so proud of their work. That's part of the fun! I'm so glad that you stopped by to see how the soddy is coming along. First, So sorry to hear about your spray paint mishap! But glad you were able to regroup, get some hired help, and keep pressing forward! Second, YAY!!! Drying in the oven worked! I always do it for my coffee grinds and tea leaves (for mini potting dirt) and for small sticks (firewood) to make sure the little bacteria/bugs that may be hidden in them are fully dead too. I'm glad it gave it the right color too! Third, It's interesting that they could have larger and/or many windows...if they could afford it. But it might mean giving up wood roof and/or floors -- I love how details like that influence architecture: like in England/Ireland during the glass window tax (homes were then built with fewer, smaller windows to avoid the tax) or in New Orlean's with the door tax (so people started installing larger, lower windows as entry/exit points). Although I know it will be sparse and there will be a lot of "doing without", I cannot wait to see the house come together and be furnished...out of curiosity, will the farm animals (chickens) be in the house too? I one time saw an interesting hosier type piece of furniture with chicken pens underneath - always wondered if it was authentic to history or a figment of a contemporary person's imagination of history. Or, if animals aren't kept in the house, did the sod home owners have animal pens butted up to the house (little animal sod homes? ), or did animals just roam free outside, etc.? Can't wait for the next installment of the journey! Hi, Lori - I really enjoyed reading your nice long comment and the interesting questions that you posed! I also learned a couple of new things: Although I'm familiar with the England/Ireland glass window tax, I had never heard of the door tax in New Orleans nor the unique Hoosier cabinet with chicken storage below! Whether that's a fact or not, it's certainly an interesting concept! Domestic animals weren't kept in the sod houses - typically, the soddies were so small that there was scarcely room for the human inhabitants. Of course, numerous critters of a different sort, such as spiders, scorpions, snakes, mice, rats and other creepy-crawlies invited themselves in through any crack or crevice in the sod walls. Not fun! Many homesteaders owned a few chickens and a pig or two, in addition to a milk cow and a work horse, so these were provided with shelters made of sod, usually enclosed on only three sides, with a willow brush roof reinforced with piled hay. The front openings could be blocked with more stacked brush to keep out the harshest weather and most predators. I'm sure there were also many "free range" chickens which had to fend for themselves - but the family egg collector would have had a hard time rounding up any eggs! As for your last question - just when we were seriously discussing the kayak vs. ark dilemma - behold, the rain stopped and October reverted to its normal balmy weather with generous golden sunshine. And I do hope that continues for a long time! You are like a walking, talking textbook of Architectural HIstory and your new Prairie Soddy is going to be like taking a step backwards in time. I am VERY INTERESTED in this project because my Great Great Grandparents immigrated from Texas to Oklahoma then across the border into the Manitoba and Alberta, Canada to homestead the province under similar government requirements as you've sited here. You have already made a HUGE amount of progress and I am already getting a good feel for the sense of place. The melting styrofoam surprise has also happen to me but it can provide some very interesting textures so i'm glad that you're going to keep it for filler. Hi, Elizabeth - I'm so glad that you visited my blog. I was very interested to learn about the immigration of your great, great grandparents into Canada. I know little of my ancestors, so I'm always fascinated to hear the family history of others. I'm still not spending much time working on the soddy - family, travel, and the stuff of daily life just keep on taking up my time! But any day now (I keep telling myself) I'm going to suddenly discover great chunks of free time - then I'll definitely be on that Sod House Roll that I mistakenly thought I was already on. I'm looking forward to that day! Thanks for stopping by. What a great post. I am really enjoying getting to know about soddies. I cannot imagine having to choose between flooring and windows. I am happy you chose the windows as not enough light might make this feel a bit too cave like. I was sorry to hear about the spray paint mishap, but glad that it was not a complete waste...not to mention it is lovely to have your grandson helping out. I cannot wait to see the next chapter in this wonderful adventure. N.B. Please tell Robert his kayak is stunning. What a beautiful finish! Hello, Giac - It's so nice to hear from you! I'm glad of your interest in sod houses, because in spite of all the drawbacks to actually living in one, I definitely have a soft spot in my heart for those brave little structures - and of course for the brave pioneers who built and lived in them - happily enough, for the most part. The next chapter in my adventure is underway, but progressing slowly. (Where does my time go?) But I'm having a good time living vicariously in the past and can't wait until I can move into my soddy! Robert sends his thanks for your lovely compliment on his kayak. He has taken it out quite a few times in local lakes and on a river. Now he's planning to go back to Washington with our youngest daughter (Leo's mother) in the spring so that they can build one for her. She loves kayaking as much as her dad does! Just discovered your blog. Such interesting information and techniques! Looking forward to following you! Hello, Veronique - and welcome to my blog! I'm so glad that you discovered it and that you'll continue to stop by to see what's happening in the construction of the sod house. The whole thing is a big experiment, and some of my experiments are big failures, which definitely makes me wonder how those pioneers managed to build their Real Life soddies! But I'll continue to try to get this one together. Thank you so much for your interest, and I hope to hear from you again. What a wonderful new project Marjorie.. I can't wait to follow along! I've never heard of sod homes before so it looks like I'm going to get a history lesson as well as a tour through your wonderful mini making... Two of my favourite things.. how fun! Hi, Sam - I just hope that I don't over-do the history lessons! I've done so much fascinating reading in my research for this project that I feel this overpowering urge to share my new "knowledge." But it is an interesting subject, and so far an interesting build - and not as easy as I had thought it would be, so in spite of its small size, my soddy may take a while to complete. I hope your interest will continue and that you'll keep on following along. Thanks for stopping by! very beautiful and so lovely work :) i like your good idea ,Thanks for the inspiration! I'd love to hear your comments! Copyright Marjorie Bailey. Simple theme. Theme images by bopshops. Powered by Blogger.